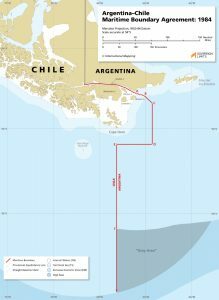 The maritime boundary between Argentina and Chile is composed of a 1977 Arbitral Award defining the boundary in the Beagle Channel and a 1984 bilateral Agreement extending the boundary out to 200 nautical miles (M) from Chile’s relevant coastal base points. From point F, located at Argentina’s 200 M limit, the boundary continues on a due south bearing until it reaches Chile’s 200 M limit. 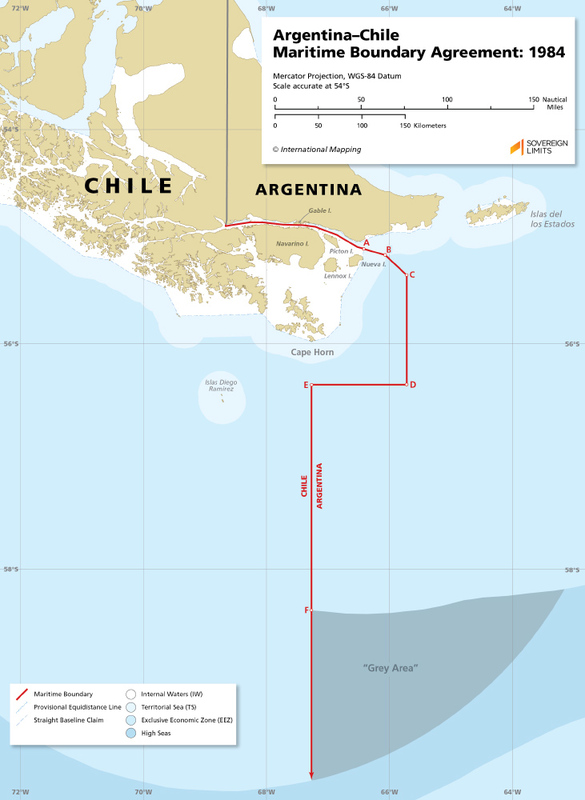 In doing so, the boundary leaves a sizeable maritime area on Argentina’s side of the boundary that is beyond their 200 M reach but within Chile’s 200 M reach. This “grey area” appears to have been ceded to the high seas by Chile as part of the 1984 Agreement.